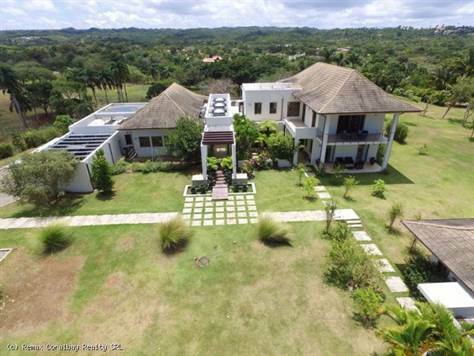 Ultra luxurious Caribbean villa which was featured in the local Architectural Digest, is located on the north coast of the Dominican Republic between Sosua and Cabarete and is offered for sale fully furnished and in immaculate condition . The main house consists of 4 bedrooms + maid’s quarters, with a further 2 bedrooms located within the guesthouse. The villa sits on 21,000m2 of land (just under 5 acres) and is on 2 separately titled lots. The new owner could choose to sell of the western section for another home if required. Each land area has it’s own utility connections on site. The large guesthouse offers an open plan sitting / kitchen / dining area and 2 large en-suite tastefully finished bedrooms. Stepping through the gallery style full glass entrance doors and in to the villa you are greeted by a large living space with fabulous views across the pool and on to the El Choco national park area. The villa features custom woodwork and wooden vaulted ceilings throughout. The ground floor comprises of open plan living / dining area with the kitchen area offset. The gourmet kitchen is the perfect place for the chef in your household with large counter tops and multiple fridges / freezers / ovens to concoct anything your imagination desires. The kitchen is modular in design and can be rearranged if required. In addition to the main kitchen is also a maids kitchen for convenience. The main living area has beautiful views in every direction and a coffee / bar area off-set. Moving through the villa towards the western wing you can find the well-equipped media / 2nd living room and 2 of the beautifully furnished guest suites. The main suite is on the top floor and accessed from a gorgeous stairway. As well as the master-suite, the second level also has a separate fully equipped gym. This area could be easily converted to an additional bedroom if required. All the bedrooms are en-suite with large bathrooms and have cedar walk-in closets.